"Don't look away from me!" the woman, Ana Maria Archila, told the Arizona Republican while he was in a Senate building elevator. Hours after being confronted by sexual assault survivor, Sen. Jeff Flake may have single-handedly blocked the path, at least for a time, of Brett Kavanaugh's confirmation. Flake, R-Ariz., voted to advance the nomination out of the Senate Judiciary Committee on Friday but then urged his colleagues to support an FBI investigation before a full Senate vote. He called for the vote to delayed for one week to allow time for the FBI to reopen its background investigation into Kavanaugh, who is facing multiple allegations of sexual misconduct. That came after Ana Maria Archila, 39, confronted the Arizona lawmaker on Friday morning and told him she is a sexual assault survivor, moments after he had announced his support for Kavanaugh. "Don't look away from me! Look at me and tell me that it doesn't matter what happened to me, that you will let people like that go into the highest court of the land," Archila told Flake while he was in a Senate building elevator, a confrontation that was captured on film. Archila, the co-executive director of the Center for Popular Democracy, a New York-based nonprofit group, later identified herself on Twitter as the survivor and told The New York Times on Friday she "wanted him to feel my rage." 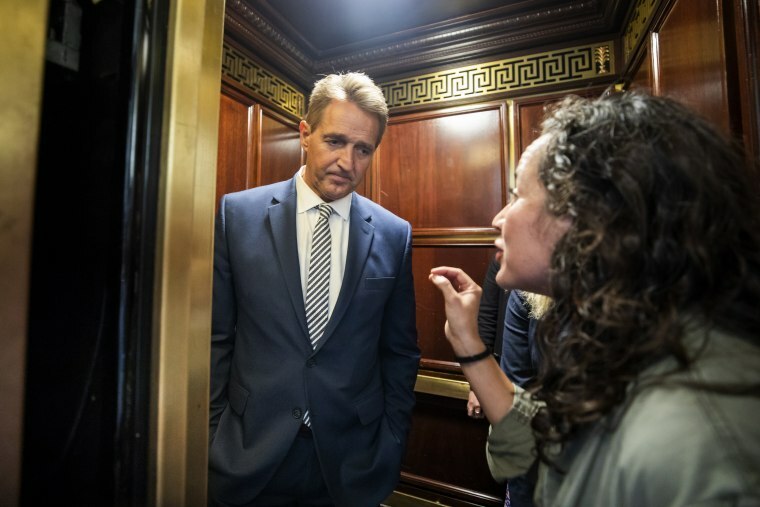 Maria Gallagher, 23, was the other woman with Archila who also confronted Flake in the elevator, the paper reported. Archila did not respond to multiple requests for comment. It is not known if the interaction had an effect on Flake's call for a delay, which has been joined by at least one other Republican and could potentially force President Donald Trump to order the FBI to get involved if he wants to save Kavanaugh's nomination. Flake did not respond to the woman. He, at times, shifted his gaze away from her during the brief encounter. It is not clear what was said before or after the confrontation. Flake's decision comes a day after an emotionally charged hearing in which Christine Blasey Ford, the woman accusing Kavanaugh of sexual assault, and Kavanuagh testified before the Senate Judiciary Committee. The committee voted 11-10 along partisan lines on Friday not to subpoena Mark Judge, who Ford said was present when the attack took place in the 1980s. The committee vote prompted several Democrats to walk out of the hearing. Ford testified on Thursday, in a hearing that lasted roughly nine hours, that Kavanaugh sexually assaulted her when they were teenagers. Her voice breaking at times, she described the alleged assault in often graphic terms, telling the committee that she was there testifying out of a sense of civic duty "not because I want to be. I am terrified." Kavanaugh bluntly denied Ford's allegation in an angry, tearful opening statement. He blasted Democrats on the Senate Judiciary Committee for replacing advise and consent "with search and destroy."